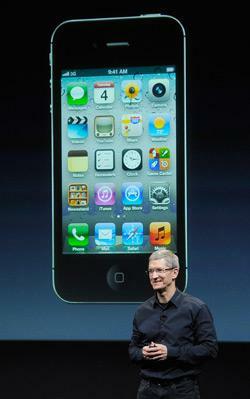 iPhone 4S: Apple’s unexciting new phone could open the mobile market for Google and Microsoft. It’s been 15 months since Apple unveiled a new iPhone—the company usually announces a new model every summer—and all that extra time had fueled speculation that there’d be something more—something huge. One thought was that we’d have two iPhones: The regular high-end model that sells for $199 with a two-year carrier contract, and a new, down-market iPhone that Apple would sell for less than $300 without a contract. But that didn’t happen. The 4S—which will go on sale Oct. 14—is all we got. Apple will continue to sell the old iPhone 4 for $99, and it will give away the two-year-old 3GS, but you get those deals only if you sign a contract with a carrier. This time you do get one more carrier to choose from: In addition to AT&T and Verizon, the iPhone will be available on Sprint, too. Now, it shouldn’t come as a surprise that the new iPhone doesn’t look different from the old one. Every iPhone looks pretty similar to the old one. Last year, I argued that Apple had “reached the limits of industrial design”—the first iPhone, a flat sheet of glass with one main button, was such a perfect template that Apple doesn’t need to change anything. With the iPhone 4S, the company is making that limitation explicit: An “iPhone 5” wasn’t going to look so different after all—it would have been slightly thinner and lighter, which you wouldn’t have noticed when it was stuffed in a protective case—so why go to all the trouble? Consider, too, that the iPhone 4 is the best-selling phone on the market, and over the past year, Apple’s sales have kept increasing. The older the iPhone got, the more people bought it—so why not just milk it for another year? The real advances in the new iPhone are in its software. The new phone will carry iOS 5, an updated operating system that includes a few minor interface improvements, as well as iCloud, a system that lets you sync data between all your devices. These features are nice—I used the iOS 5 beta for a few months this summer—but not revolutionary. Both Google’s Android OS and Microsoft’s Windows Phone already have several of the features that Apple is adding in iOS 5. The “killer” feature here—by which I mean, the one you can expect to see pimped in TV and magazine ads for the next year—is the Siri assistant. Apple acknowledges that other phones offer voice recognition, but it argues that Siri will do more than just recognize what you’re saying. Siri will understand and act on it. “Move my meeting with Kelly to 12,” you can tell your phone. Siri checks your calendar and—in a voice that sounds exactly like Rosey, the Jetsons’ maid—replies: “You already have a meeting at 12. Should I schedule this anyway?” Siri can read your texts aloud and lets you dictate your replies. It can set “contextual” reminders based on your location or people in your contacts. For instance, you can say, “Remind me to call my wife when I leave work,” and the phone—which has learned the GPS coordinates of your office and has deduced, based on previous correspondence, the identity of your wife—will offer to make the call once it notices your location has changed. This will look great on TV, but the question is whether it will work well enough in practice to make it useful. Voice recognition is difficult, and Siri is sure to stumble just as often as the iPhone’s autocorrect system. If these stumbles prove embarrassing—if it recommends Indian restaurants when you asked for Italian, or if it calls your mistress instead of your wife—Siri could prove more trouble than it’s worth. Apple’s sales and profits are way ahead of any other smartphone maker in the world, and nothing in today’s news suggests it will lose that spot. The iPhone 4S will surely be a blockbuster. Still, Apple is slipping. Last week, I raved about Microsoft’s new Windows Phone. Amazingly, Microsoft’s mobile OS looks simple and fresh compared with Apple’s and Google’s now aging mobile interfaces. Now that I’ve seen the new iPhone, I’ll reiterate my advice, which would’ve been unthinkable even a few months ago: Give Windows a shot. The iPhone is still the king, but there are now plenty of challengers to its throne.